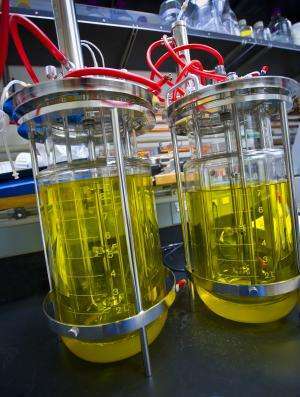 The first dynamic regulatory system that prevents the build-up of toxic metabolites in engineered microbes has been reported by a team of researchers with the U.S. Department of Energy (DOE)'s Joint BioEnergy Institute (JBEI). The JBEI researchers used their system to double the production in Escherichia coli (E. coli) of amorphadiene, a precursor to the premier antimalarial drug artemisinin. Using genome-wide transcriptional analysis, the JBEI researchers identified native regions of DNA – called "promoters" – in E. coli that respond to toxic metabolites by promoting the expression of protective genes. They then developed a system based on these promoters for regulating artificial metabolic pathways engineered into the E. coli to enable the bacterium to produce amorphadiene. "Static regulators of toxic metabolite levels have been developed but this is the first metabolite regulator that responds to changes in microbial growth and environmental conditions," says Jay Keasling, CEO of JBEI and ranking authority on synthetic biology, who led this research. "Control systems that can sense and respond to environmental or growth changes are needed for the optimal production of a desired chemical." Keasling, who also serves as Associate Laboratory Director of Biosciences at Lawrence Berkeley National Laboratory (Berkeley Lab), the lead institute in the JBEI partnership, is the corresponding author of a paper describing this research in the journal Nature Biotechnology. The paper is titled "Engineering dynamic pathway regulation using stress-response promoters." Co-authors are Robert Dahl, Fuzhong Zhang, Jorge Alonso-Gutierrez, Edward Baidoo, Tanveer Batth, Alyssa Redding-Johanson, Christopher Petzold, Aindrila Mukhopadhyay, Taek Soon Lee and Paul Adams. From life-saving drugs, such as artemisinin, to sustainable, green biofuels, the metabolic engineering of microbes for the production of valuable chemicals continues to grow in importance. To date, the most productive microbial hosts have been those engineered with heterologous pathways for which they have little or no native regula¬tion of the metabolites being expressed. However, such unregulated expression of heterologous enzymes can be toxic to the host, which can limit the production of the target chemical to well below levels that could be obtained. "Although synthetic biology has made great strides in creating novel, dynamic genetic circuits, most control systems for heterologous metabolic pathways still rely on inducible or constitutive pro¬moters," Keasling says. "Approaches developed to tailor expression strength by means of promoter libraries, mRNA stability or ribosome-binding are optimized for a particular growth phase or condition in the bioreactor, however, growth and environmental conditions change during the fermentation process." Since the accumulation of intermediate metabolites to toxic levels in a microbe during a fermentation process can lead to a stress response, Keasling and his JBEI colleagues reasoned that it should be possible to tap a host microbe's native stress response system when metabolites accumulate. Transcript profiling of the E. coli genome allowed them to evaluate transcrip¬tional response to a heterologous pathway and create a list of promoters that could be used to respond to intermediate toxicity. "Using such promoters to regulate pathway expression in response to the toxic intermediate metabolites creates a link between the cell's metabolic state and the expression of the metabolic pathway," Keasling says. "This enables us to create biosensors that respond to and regulate pathway intermediates. In silico models have indicated, and we've demonstrated in this study that our approach can be used to improve production of a desired chemical over common inducible promoters and constitutive promoters of various strengths." Keasling and his colleagues believe their dynamic approach to metabolite regulation could be extended to higher organisms as well, where constitutive promot¬ers are still commonly used. This holds potential for – among other things - improving the accumulation of nutrients in food crops, or decreasing the lignin in energy crops that makes extraction of fuel sugars difficult and expensive. "What we're looking at are strategies that could help reduce the problems associated with feeding a larger global population or efficiently converting biomass into renewable fuels," Keasling says.